The cerebrum is the largest part of the brain (Fig. 17-3). It is composed largely of white matter with a thin outer layer of gray matter, the cerebral cortex. It is within the cortex that the higher brain functions of memory, reasoning, and abstract thought occur. The cerebrum is divided into two hemispheres by a deep groove, the longitudinal fissure. Each hemisphere is further divided into lobes with specialized functions. The diencephalon contains the thalamus, the hypothalamus, and the pituitary gland. The thalamus receives sensory information and directs it to the proper portion of the cortex. The hypothalamus controls the pituitary and forms a link between the endocrine and nervous systems. of the brainstem. It contains fibers that connect different regions of the brain. The medulla connects the brain with the spinal cord. All impulses passing to and from the brain travel through this region. The medulla also has vital centers for control of heart rate, respiration, and blood pressure. 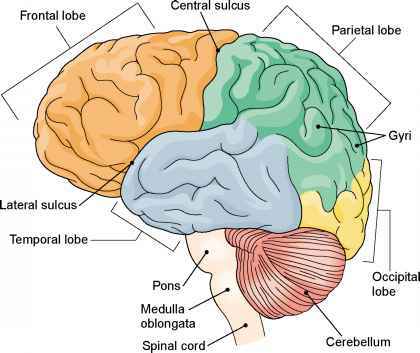 The cerebellum is under the cerebrum and dorsal to the pons and medulla (see Fig. 17-3). Like the cerebrum, it is divided into two hemispheres. It helps to control voluntary muscle movements and to maintain posture, coordination, and balance. FIGURE 17-2. A motor neuron. The break in the axon denotes length. 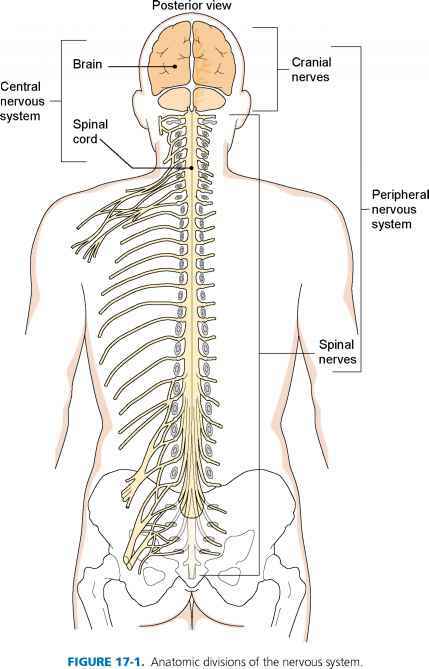 The arrows show the direction of the nerve impulse. Within the brain are four ventricles (cavities) in which cerebrospinal fluid (CSF) is produced. This fluid circulates around the brain and spinal cord, acting as a protective cushion for these tissues. Covering the brain and the spinal cord are three protective layers, together called the meninges. 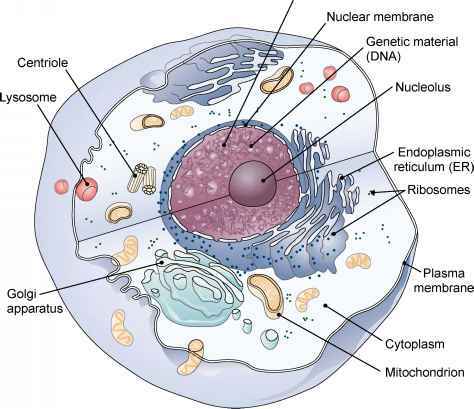 The outermost and toughest of the three is the dura mater. The middle layer is the arachnoid. The thin, vascular inner layer, attached directly to the tissue of the brain and spinal cord, is the pia mater. Twelve pairs of cranial nerves connect with the brain (see Fig. 17-1). These are identified by Roman numerals and also by name. See Display 17-1 for a summary chart of the cranial nerves. FIGURE 17-3. External surface of the brain, showing the main parts and some lobes of the cerebrum. What are the main parts of the brain? What are the medical terms for the layers of the brain? How does a nerve impulse travel through a neuron arrows?